Wisconsin, Lake Michigan, lakefront. Summertime. Gulls. 8 species!! Finding a couple of white-wingers, a couple of black-backeds and a couple of hooded gulls on the same day in mid-June is very doable here. 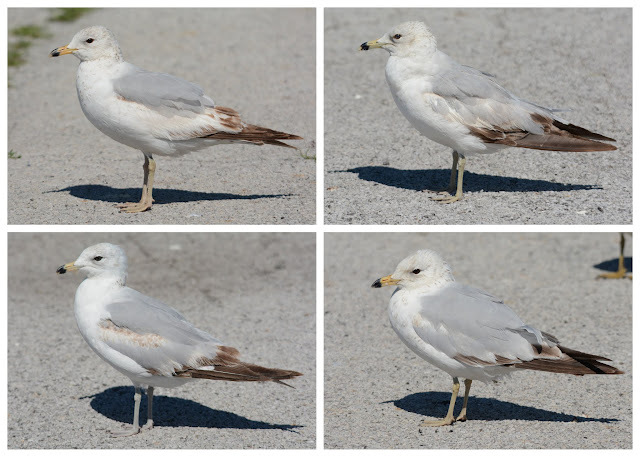 I spent most of Saturday, 19 June 2015, working the gulls from Milwaukee county to Manitwoc County. Mantiwoc was - again - the most rewarding stop: 2 Little Gulls, 1 Kumlien's Gull, 2 Great Black-backeds and 1 Lesser Black-backed. Sheboygan proved to be slow (as it has been all season) with only 2 Lessers. Port Washington gave up a distant first summer Glaucous. Overall, Bonaparte's and Lesser Black-backed numbers have been somewhat disappointing compared to the last three years. I suppose this is a direct consequence of little to no dying shad along the immediate shore. From a distance, I could see plenty of Caspian Terns finding fish and they seem to catch them almost effortlessly. With that said, the smaller terns (Common and Forster's) are also in short supply.